Here's this week's sketch. We're going back to the CAS roots with this one! It's a one layer (or mostly one layer) delight! Apparently we both felt like using products from our Hero Arts stash for this week's sketch. 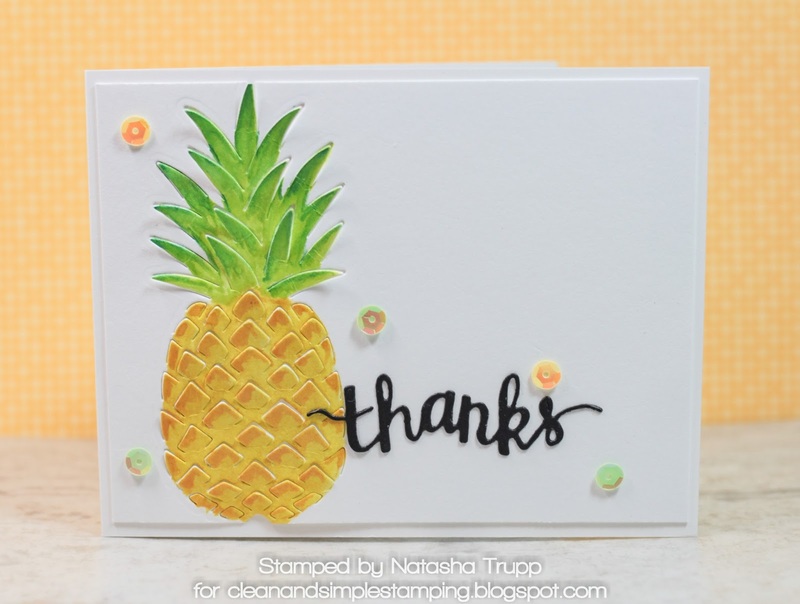 I really love this paper layering pineapple die, but don't have the need or opportunity to use it all that often. Since it's a larger die, I figured it would work nicely with this sketch. I die cut it on some cotton letterpress grade paper and then started watercolouring the image with twinkling H2Os. Once it was dry, I pushed the cuts out. 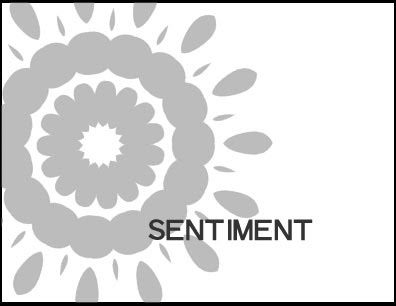 Because of the boldness of the colours, I decided to use a die cut word for the sentiment. Just as I'm typing this, I realize that this wasn't really an option back when I first featured this sketch. Dies were barely just a thing, and word dies really were not common. Technically, the card was fine as it was, but I have these fun yellow and green sequins, so I thought I would add a few for some interest. This sketch screamed stencil to me! 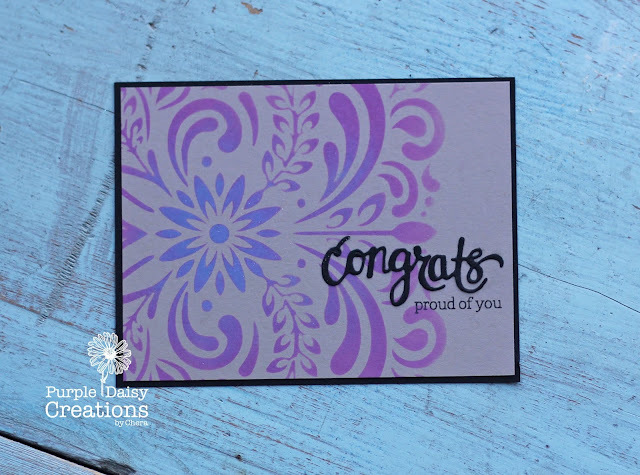 I pulled out a few and tested them out and this leaf and flourish stencil from Hero Arts was the winner!! I decided to use my distress oxide inks (picked raspberry and peacock feather) on some Kraft card stock! Love that these inks stay so vibrant on coloured card stock!! Once I was done with the ink blending I took out the Hero Arts congrats die with stamp set to finish off the card! Then mounted it onto black card stock! This card is a pretty simple one to make! Would love to use some other oxide ink combos to switch it up!!! Thanks for stopping by and I look forward to seeing what you create! Good morning! I hope you're all ready for the next sketch! I decided to make a Valentine. I love the XOXO set and the coordinating dies, so I decided to use those. 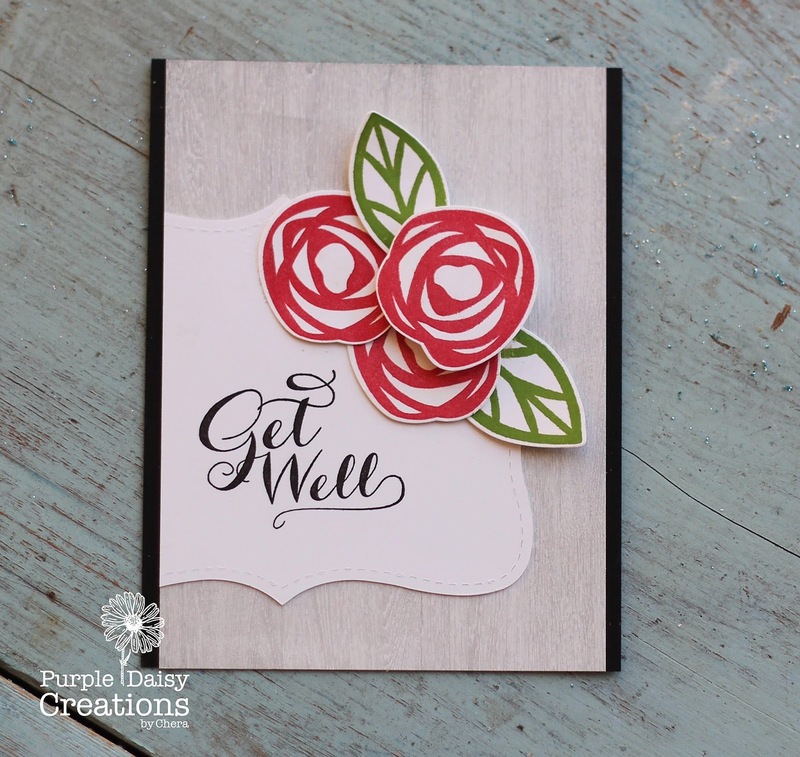 I stamped my own pattern paper using Berry Sorbet, Sweet Blush, Pale Peony, and Autumn Rose on some Stamper's Select. Next I died cut a heart out of Autumn Rose and white. The "Be Mine" was cut out of Berry Sorbet, although I also cut out a white layer. 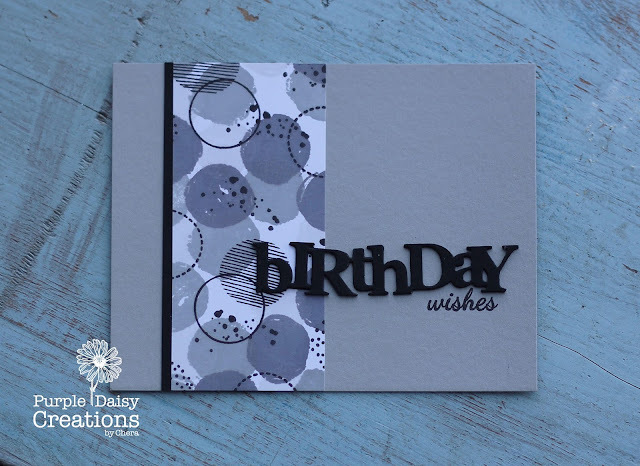 A good tip when placing die cuts with openings is to cut out a second image in white, and place that in the openings to make it "pop" more and not blend into the background as much. I also added a touch of Wink of Stella on the die cuts. Here's Chera's card! She went with an awesome birthday card- would be great for teens or when you need a more neutral card. Hello again everyone! Hope you all had a great week! Here's my take on this week's card sketch!!! Had some fun using the Dotty Turnabout set from Concord and 9th. It's been in my stash for a while now and my first instinct with it was to do greys. These are 3 greys from the Simon Says Stamp line: Smoke Fog and Slate, with a few added black details from other stamps in the set as well. I cut down my stamped image to make a panel on my card front and lined the one side with some black card stock, then adhered it to the card base. Then I pulled out a Papertrey ink Birthday die and added the small sentiment under it. And there you have it!! Had a lot of fun with the turnabout stamp!!! Look forward to seeing your creations! This sketch may feel like a bit of a "throwback" for some of you. It features the Bigz Top Note die. For those that don't recall, this was when Stampin' Up! 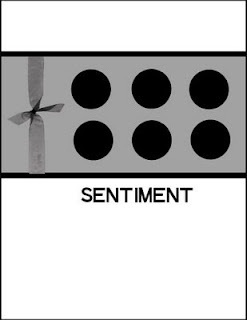 had just introduced carrying the Big Shot and had designed a few exclusive dies. 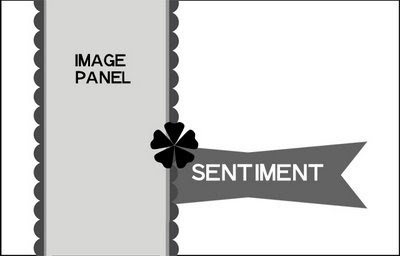 Of course, feel free to use some other element for your card if you do not have the Top Note die. Here's my card. 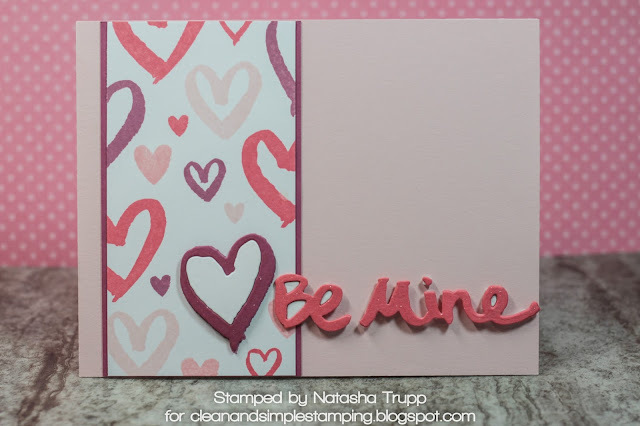 Since I had to pull out an older Stampin' Up! die, I figured I would use other Stampin' Up! products with it. I used a few greetings from Bravo and some of the flowers from Flower Patch. I found my yellow base layer a little too plain, so I stamped one of the flowers from the same set repeatedly to make a nice simple pattern. Happy Sunday everyone!! Hope you had a great week!! Here's my take on this weeks sketch! 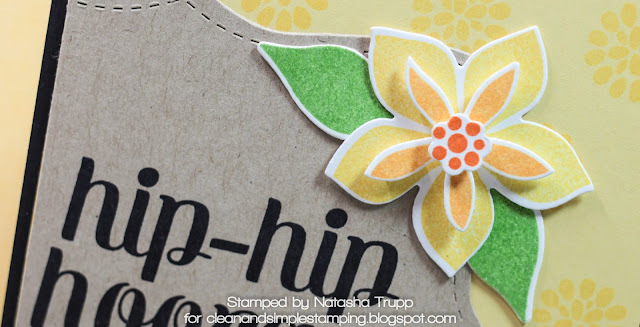 Had to do a little digging to find that top note die from Stampin Up….might I add its the first stitched die I every owned! hehe!! Hope you like today's sketch and I look forward to seeing what you create!! Please leave a link to your project below! I hope you're all having a good new year so far! I've got a birthday card today since it's my birthday this coming week! Here's the sketch- once again, I'm encouraging the use of ribbon or some other sort of fibers! As I was pondering what to make with the sketch, I started to look through my stash looking for a fun small image. One that would look good if repeated. I quickly found the Sprinkles Turnabout by Concord & 9th. 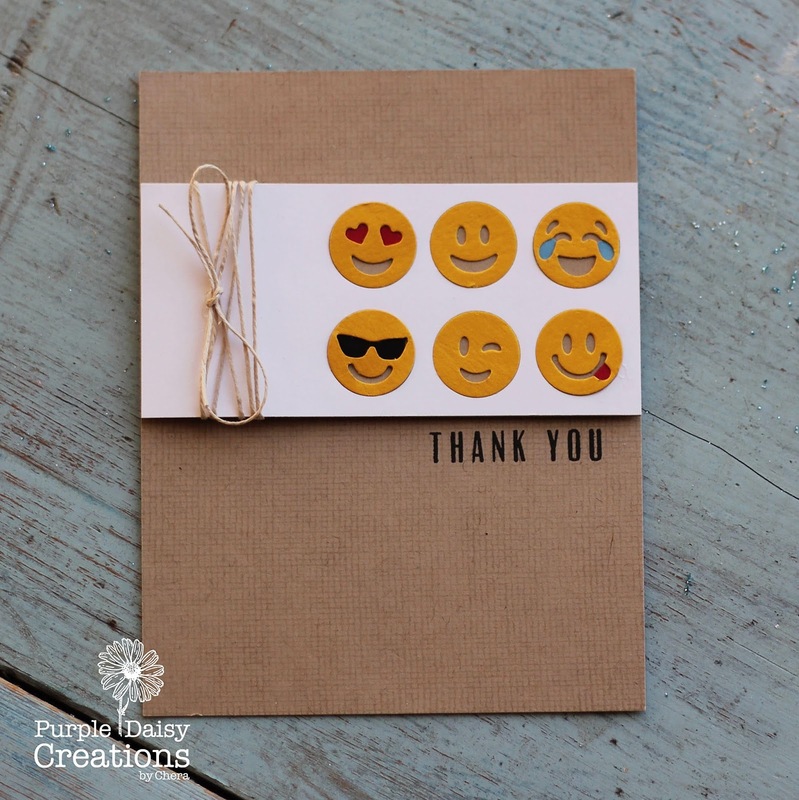 One of the things I love about this set is that in addition to the "turnabout" part of the stamp set, it comes with a few images and sentiments too. I stamped 6 cupcakes and felt inspired to make lemon and strawberry cupcakes. 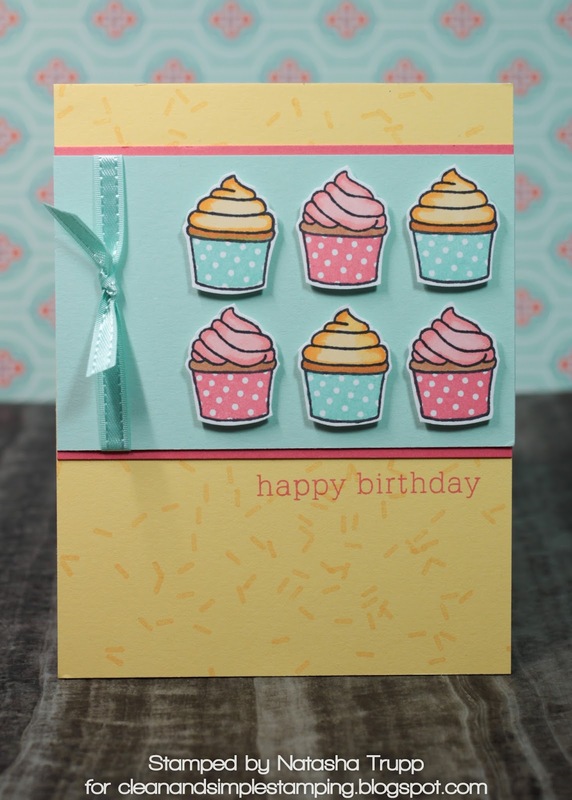 I used the dotted pattern in the stamp set for the cupcake holder. The icing and cupcake itself were coloured with Copic markers. I used these colours for the rest of my card too. 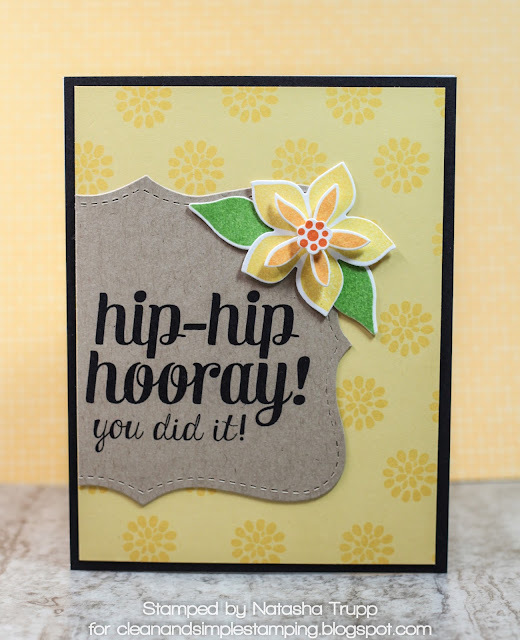 Harvest Gold became the card base, stamped with a few rotations of the Sprinkles Turnabout. Aqua Mist became the base layer for the images and Berry Sorbet for the Mat. I found some old Pool Party ribbon from my stash that always coordinated nicely with Aqua Mist. Finally, I wanted a simple greeting, so I pulled out an old favorite, Birthday Basics. 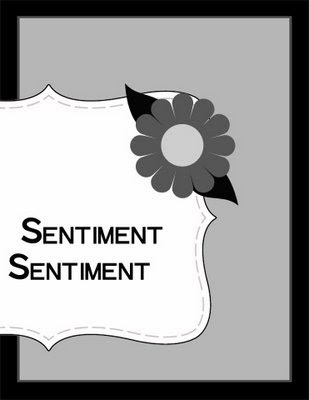 This has to be one of my most used birthday sentiments, after all these years! This sketch made me have to pull out my emoji dies cuts!! And seriously how fun are they!! I actually bought the set originally for the poop emoji that's in there but decided to use the faces today!! First off I die cut the circles on the white using my t-ruler to make sure they were all lined up and straight. Once that was done I die cut them again in the yellow. I then used scrap paper to add the additional colours to their faces! Once that was done I glued it all down onto a kraft piece of paper so the rest of their faces were that colour!! I tried to replicate as best I could ;) Once that was finished I took a piece of Kraft card stock and stamped a linen background onto it just for a little more detail. I pulled out some twine for the ribbon aspect of the sketch and then popped up the panel onto the card front! Stamped the thank you and there's the finished product!! This is such a fun card I think I’ll be making it for kids birthday cards as well!! And maybe add the poop emoji! How can you tell I live with all boys! !